Directed by Drama Professor Annie Loui, this dramatic movement piece is constructed in the style of Loui’s CounterBalance Theatre, in which actors play multiple characters, as well as animals, elements, and architecture. “It’s great fun for the actor embodying Zeus to become an old Greek warrior, or a chair, or a horse pulling a chariot in the next moment,” Loui says. “I love the way we can tell stories ignoring conventions of time and place on stage, by just ‘becoming’ characters or animals or forces of nature. I find the medium really liberating as a means of illuminating great literature.” What we now call classical poetry was, after all, the “action adventure” genre of its day. Loui also points out that, though Homer’s Iliad is a complex classical work, this adaptation (based on Books 1 – 8) is sometimes very funny and quite relatable, exposing many of the human foibles and challenges we still face today. She notes that even the gods are not exempt, “intervening behind each other’s backs, and using their superhuman powers at cross-purposes. And the mortals are just as caught up in proving themselves, complaining, being lustful or fearful or prideful, as is any 21st century person.” She hopes that heightening the accessibility of this material in a visceral way will allow audiences to experience the exhilarating power of this timeless (and ever relevant) story. Evenings: Oct. 13, 14, 15 @ 8 p.m.
Matinees: Oct. 15, 16 @ 2 p.m.
General Admission $15 / Seniors & Groups 10+ $14 / UCI Students & Children under 17 $11. Box Office at (949) 824-2787 or www.arts.uci.edu/tickets. UCI Illuminations, the Chancellor’s Arts and Culture Initiative, will host two After-Panels with scholars from the School of Humanities and the artistic team to discuss the impact of Homer’s Iliad and the aims of the production. The first will be on Saturday, October 15 after the 2 p.m. matinee featuring Prof. Oren Izenberg and Director Annie Loui; plus the cast and artistic team. The second will take place on the same day after the 8 p.m. performance and features Prof. Zina Giannopoulou on Greek context and Prof. Andrew Zizzos on epic responses; plus Loui, cast, and artistic team. The UCI Drama production team will also host a post-performance TalkBack on October 16 after the 2 p.m. matinee with the creative team and cast. 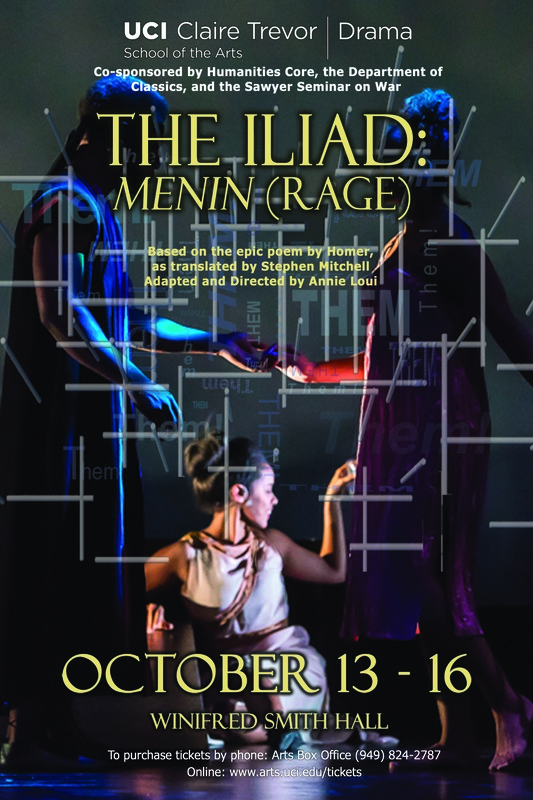 UCI Drama presents seven diverse and stimulating productions in the 2016 – 2017 season: The Iliad, Parade, Our Class, Coriolanus, Clown Aliens, I Dream of Chang and Eng, and Avenue Q. Thematically entitled THEM!, the season features productions that reveal and explore society’s xenophobic tendencies and the human impulse to scapegoat and cast blame on “the other.” The productions creative teams concentrate on presenting the thoughtful journeys of these characters through the character’s voices and experiences.